It’s never ideal to check into a hotel in the late evening. But it’s even less ideal when you’re planning on taking photographs of that hotel for a review! Luckily, the staff at the hotel were super helpful when I explained my dilemma. And the next morning I was able to take photos in a freshly made up room, so all was not lost. Moxy hotels are part of the Marriott group of hotels. There are currently hotels open in Aberdeen and London Stratford as well as the London Excel hotel. London Heathrow and five other UK hotels will be opening in 2018. The hotel’s website describes Moxy as ‘a affordable hotel for every budget with the soul of a boutique hotel’. And as soon as you go through the door of the Moxy London Excel, you know that there’s something different about this hotel. Inside the reception area, there is a combination of industrial architecture, pop art on the walls, and a range of board games. Definitely not your standard hotel reception! There are also big armchairs to relax in, giant board games, and even a football table. Ceiling-to-floor windows around the lounge area of the hotel flood the room with masses of natural light. With free high speed wifi throughout the hotel, this is definitely somewhere you could catch up on some work, or meet up with friends and family. This double room is identical to the room that I stayed in at the Moxy London Excel. There are also twin rooms available, as well as family rooms which have a double bed and a sofa bed. The bed is very comfortable, and the high thead-count bed linen is as crisp as you would expect from a Marriott hotel. I thought that the quilt was a little thin, but I do like to be toasty warm in bed. Luckily the air con in the room was very efficient and I had a good night’s sleep. That said, I would prefer to have had a couple of extra pillows on the bed. Because this room is quite compact, there’s no actual wardrobe, just a small hanging rail. That’s probably not a big deal if you are only staying for a night or two, but I think I’d find it a problem for a longer stay. From the wall art to the back-lit panels dotted around the room, this is not your standard chain hotel room. One nifty feature in the room is the under-bed lighting that turns on automatically if you get out of bed in the night. I also really appreciated the USB charging points at the bedside. That’s so convenient compared to some hotels where you have to charge your phone across the other side of the room! The TV at the foot of the bed is a generous 42″, and it also has internet connectivity. You can either hook up your own device to stream to the TV, or log into the internet on the TV directly. You can clear your login credentials at any time, and they will be removed automatically when you check out of the hotel. And yes, I did end up watching YouTube on the TV instead of the news in the morning. As with the bedroom, the en-suite is quite compact. There’s no bathtub in here, but a decent sized shower cubicle and a smart washstand. As with the rest of the room, everything was spotlessly clean. MUK toiletries are provided in the bathroom, along with towels that are decent sized and suitably fluffy. There is a hairdryer provided in the room, but I found that the cord was too short for me to be able to dry my hair in front of the mirror. It was a rare flaw in what is generally a well designed hotel. The snack bar area in the Moxy London Excel is open 24/7. This is fantastic for those times when you check in late and in need of something to eat and drink. The hotel provides a continental breakfast at a cost of £10 per person, and the bar serves a mix of coffees, cocktails and other drinks. The coffee sign above did make me smile, as I recently created a similar sign for my home office. There isn’t a restaurant at the hotel, but there is plenty of choice in the local area. And you are only a few minutes walk from the nearest DLR station (Royal Albert). When I booked my room at the Moxy London Excel, I wasn’t expecting much from a chain hotel that is obviously located to serve visitors to the Excel exhibition centre. And it serves that purpose very well. There’s just a 5 minute from the nearest DLR station and a similar walk to the exhibition centre. It would be perfect for anyone attending a trade show or exhibition at Excel. Although if there’s a major event on at Excel, I would expect a night to cost more than the £94 that I paid. I was completely surprised to find that the hotel was so design led, and had so many quirky touches. The room was very comfortable and I loved some of the extra features like the USB charging points. So many hotels still don’t seem to take the day-to-day requirements of travellers in 2018 into account. That’s not to say that the hotel is perfect. The need to keep the room at a compact size means that there’s no storage for clothing, so I wouldn’t want to stay here for more than a night or two. 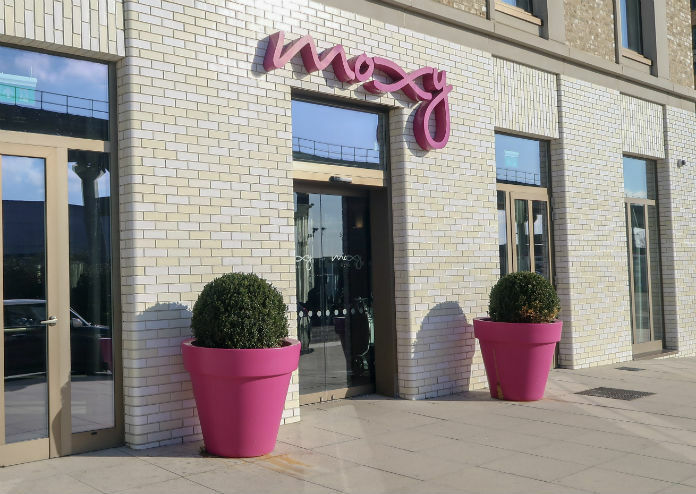 But overall I really enjoyed my short stay at the Moxy London Excel. I just wish that I could have checked in earlier to take advantage of the lounge and bar area downstairs. I love the funky style of the Moxy. I was looking to stay here before when I went to Excel. I love a hotel with personality and this hotel has it in buckets!